She could outsew Sergio Valente's top seamstress, jimmy an electrical situation faster than MacGyver could round up the ball point pen and paper clip needed for the job, and grow roses fit to make the Queen herself shed a royal tear. But the kitchen? This is where Mom truly excelled. My memory bank is filled with memories of her in the kitchen. Not only do these nostalgic recollections consist of her cooking and baking, but most are of her standing at the counter for hours, canning everything from jam to spaghetti sauce while listening to Hall and Oates or REO Speedwagon. From the time I can remember, Mom (and Grandma) would harvest the bounty of her garden so we could enjoy the flavours of summer long into the cold, miserable winters. She'd take several trips down into the cobweb-infested, dragon-breathing, ghost haunting basement and lug countless boxes of dusty canning jars back up the wooden, creaky stairs. Disassembling them one by one, she'd inspect as she went before plunging them into hot, soapy water. She'd scrub the jars clean and sterilize them in boiling water in a stockpot that was big as the stove itself. This process alone took a million years. As a kid, I lost interest pretty fast. We were never on hand to help her until she had all the fruits prepared for their vacuumed-sealed holiday. Tomatoes mercilessly stained her shirt; berries did the same to her hard working fingers. We'd constantly steal sliced peaches from the bowl and fight over who got to drink the little bit of juice that was left over at the bottom. When Mom had enough of the bickering, she'd take the bowl and drink it for herself, rendering us speechless. Despite the fact I loved eating those juicy peaches for dessert in the middle of January and was (secretly) so grateful for the thousand other jars that lined the shelf with summer's goodness, canning was a daunting, time-consuming task and one I never wanted to do as long as I lived. Why would I want to can if I could buy the same stuff in a jar at the store? Well friends, I'll tell you why. It's the feeling of accomplishment; a sense of pride, if you will. Taking one thing and turning it into something completely different with your very own hands, knowing exactly what's going into the product. Unfortunately, I didn't appreciate any of it as I do today. Canning has very quickly become a new favourite hobby of mine. Trust me, that's saying something. Sometimes I wonder why I didn't have another go on my own years ago, despite friends telling me how easy it really is. It's funny what a thirty-something-year-old brain remembers and how damn stubborn I really am. And I have this cookbook to thank. The Canning Kitchen Cookbook - 101 Simple Small Batch Recipes by Amy Bronee of Family Feedbag, reminded me how amazing the canning movement really was, is, and needs to be. It brought back so many memories for me - scratch that, it FLOODED my brain with memories, some that actually brought tears to my eyes and left me pining for the days when I would stay outside until the streetlights came on. What I adore about this cookbook is how Amy debunks many of the archaic canning myths. Long gone are the days of sanitizing and baking the jars in a hot oven before even getting started. In fact, I made this jam in one hour from beginning to end - ONE HOUR, you guys! Do you know how incredible that is? My kids were eating crackers with my jam - jam that I made with my OWN HANDS that night. It gave me bubbles in my belly and a single tear down my cheek like a bad 80s hairband music video. Best of all, Amy's recipes are all mouthwatering - and so EASY. If you can use a knife, timer, and stove, you've already succeeded. Honestly friends, this book deserves to be in your cookbook arsenal. With 101 recipes, you'll be spoiled for choice. Amy B, this cookbook is incredible. As a fellow food blogger, I'm so incredibly proud of you and I'm so happy you took the leap of faith and published The Canning Kitchen. You've made some long forgotten memories very special for me again. The tradition my Mom desperately hoped wouldn't die not only didn't, but flourished even more than she could have ever hoped for. I'm looking forward to making new canning memories with my littles and one day, I hope they look back as I did with not only a cheeky twinkle in their eye, but with fonder memories of the process than I did. And that alone is worth its weight in off-season strawberries. It's giveaway time! 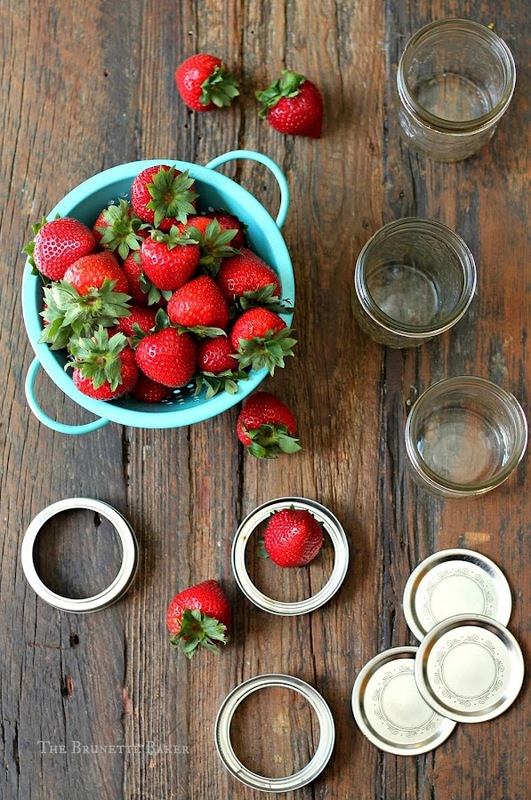 Want to try your hand at canning? 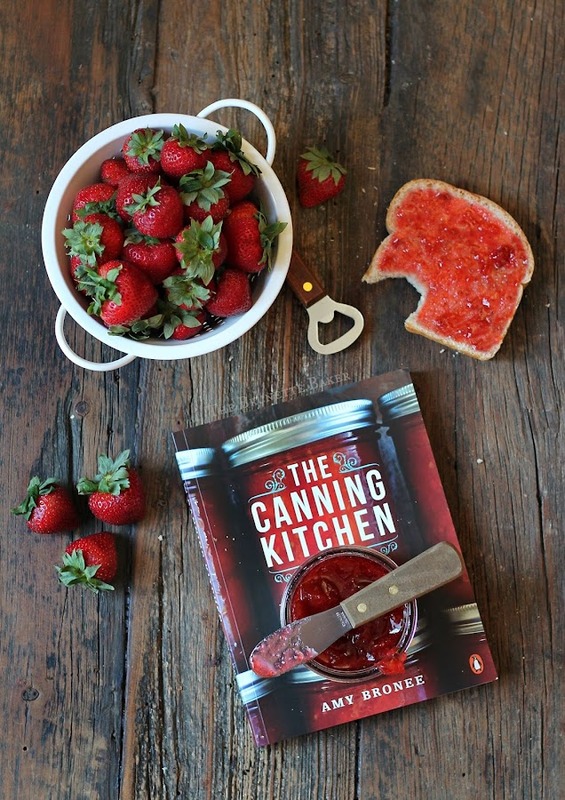 I'm giving one lucky reader a chance to win a gorgeous copy of The Canning Kitchen. Just follow the Rafflecopter prompt below and you're on your way. *FRIENDS! If you miss out on this opportunity, I implore you to come back and visit later this month as some very special people and I have yet another INCREDIBLE giveaway featuring The Canning Kitchen. Trust me, you will NOT, NOT, NOT want to miss it! Please check out these other talented bloggers all week long as they share their experiences with The Canning Kitchen. (Please know some links won't be available until Friday, August 14th. I will update them as they go live). Giveaway will run from Tuesday, August 11, 2015 to Sunday, August 16, 2015. Winner will be contacted via email and displayed on Rafflecopter widget. Email address will never be given out to any third party or anyone for that matter. Dislosure: I was given a complimentary copy of this cookbook by the lovely folks over at Penguin Random House Canada Limited. As anything and everything I review, all opinions and views are completely my own. I will never endorse anything I don't love, use, or believe in and will always give my honest opinion regardless. Apple butter will always hold a space in my heart. It was one of the first preserves my grandmother taught me to make. We'd have hours of conversation peeling apples and hovering over the stove getting the recipe just right (a pinch of this, a palm-full of that). My grandfather would say this is his favorite because it tastes great at any temperature, but especially over hot cakes. To me, apple butter = generations of unforgettable memories. Doug G.: My favourite is my grandmother's black currant jam! So yummy! My favorite is homemade strawberry jam.. So delicious!! I absolutely love strawberry jam! Like Beyonce said, I ain't ready for the jelly. I like the jam. I love raspberry jam! I would love this cookbook! My favorite jam is orange marmalade. My husband calls me an 84-year-old. lol Thanks for the chance to win. It looks like a great cookbook! I love blackberry jam! It's the best when smeared over hot butter. I'm salivating already! I love all jam. Especially sour cherry or raspberry! Love your blog and love this book. Can't wait to try some of the new jam recipes, flavoured pickled garlic. Hope everyone enjoys this fabulous new book! THIS POST MADE ME CRY! You have a beautiful way with words. I bet your Mom is so proud of the person you've become. And my favourite is grape jelly. I'm probably the 1% of the populations that likes it, but I do. Good ol' strawberry jam for me! I'm a cherry jam fan. My all time favourite is cherry jam. I have nice memories of my grandmother and cherry jam! I really love raspberry jam and peach marmalade! 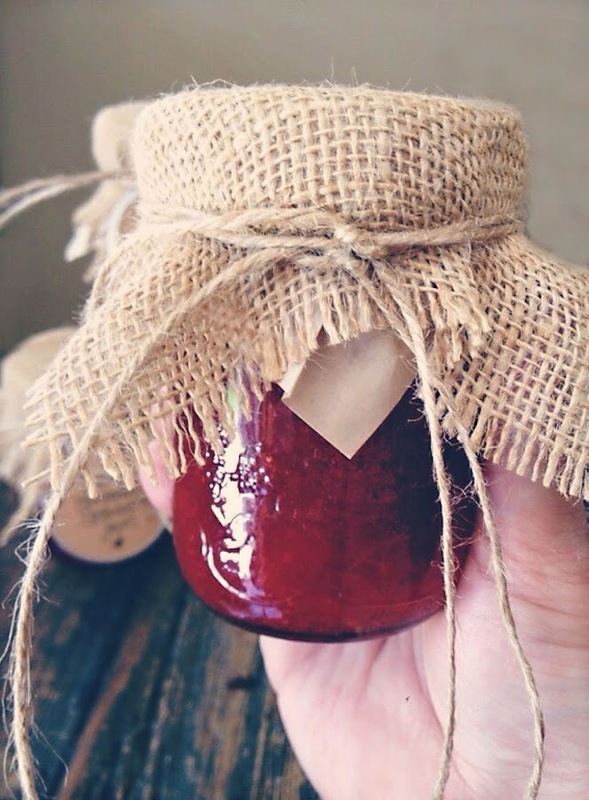 I recently tried an ambrosia jam that was seriously incredible! I like pink grapefruit jam. I'm more of a jelly girl than a jam girl, but I do love seedless raspberry jam. 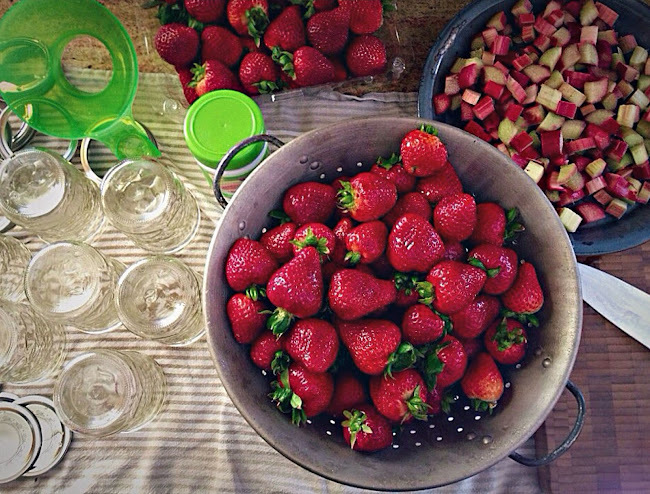 I love strawberry rhubarb anything! Your jam looks incredible! Strawberry jam is a family favourite. I love apricot or raspberry jam! My favorite jam is a raspberry rhubarb. I love raspberry jam, especially with the seeds in it! I like a good mango jam! I love homemade strawberry jam with lots of big pieces of strawberry! Yum! I adore hot pepper jelly!! But I tried raspberry rhubarb jalapeño this year and it was also amazing! I love to try different recipes and savoury ones are my go-to!! Thanks for the offer! Your jam turned out great!! Wild blueberry jam has always been my favourite. No chance of getting those in Niagara but a trip home up North in mid to late August will remedy that! Homemade peach jam is definitely my favourite, but I love doing small batches of whatever is fresh and available. Strawberry jam is my absolute favourite. I love lemon curd and strawberry jam! Strawberry jam for the win. I am a big fan of strawberry jelly...yum! This sounds amazing! I would LOVE to try the recipes in Any's Book!